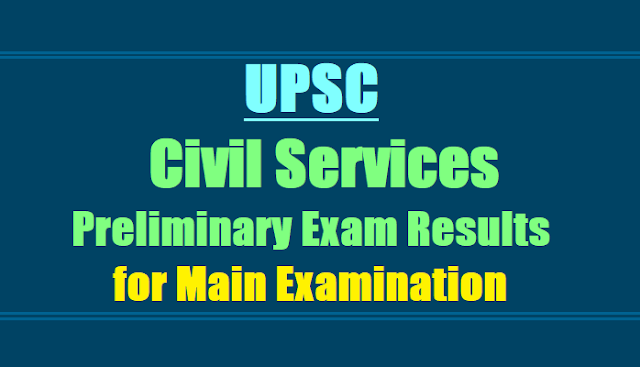 UPSC Civil Services Preliminary Exam Results 2018 for CSE Main Examination, UPSC Civils Preliminary Exam Results 2018, UPSC CSE Preliminary results 2018, Civil Services Mains Selection list: On the basis of the result of the Civil Services (Preliminary) Examination, 2018, the candidates with the following Roll Numbers have qualified for admission to the Civil Services (Main) Examination, 2018. 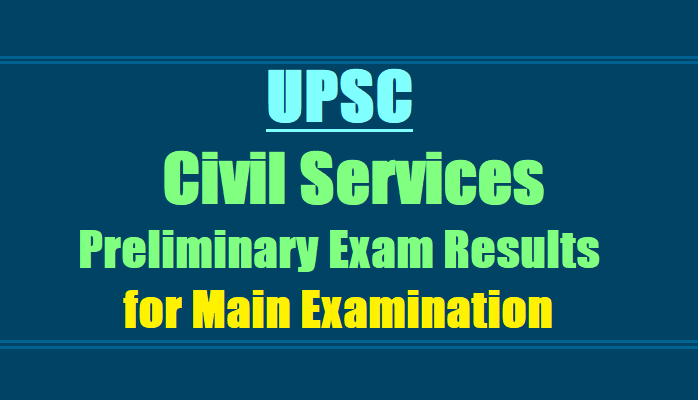 UPSC Prelims Result 2018 Declared @ Upsc.gov.in, Upsconline.nic.in: UPSC Prelims results 2018 for Union Public Service Commission (UPSC) Civil Services (Preliminary) Examination held on June 3, 2018, has been released today on the official websites of the commission, upsc.gov.in and upsconline.nic.in. The candidates with the Roll Numbers given on UPSC website have qualified for admission to the Civil Services (Main) Examination, 2018. According to the UPSC notification regarding the UPSC Prelims Results 2018, the candidature of these candidates is provisional. In accordance with the Rules of the Examination, all the successful candidates have to apply again in the Detailed Application Form or DAF (CSM), for Civil Services (Main) Examination, 2018, which would be available on the website of the Union Public Service Commission www.upsconline.nic.in. All the qualified candidates are advised to fill up the DAF (CSM) online and submit the same ONLINE for admission to the Civil Services (Main) Examination, 2018 to be held from Friday, Sepetember28, 2018. The DAF (CSM) will be available on the website of the Commission from July 23, 2018 to August 6, 2018 till 6.00 P.M. Important instructions for filling up of the DAF (CSM) and for submitting the completely filled application form ONLINE to the Commission, would also be available on the website. The candidates who have been declared successful have to first get themselves registered on the relevant page of the website before filling up the ONLINE DAF. The qualified candidates are further advised to refer to the Rules of the Civil Services Examination, 2018 published in the Gazette of India (Extraordinary) of Department of Personnel and Training Notification dated February 7, 2018. Effectively, the process of IAS, IPS and other cadre selection under the UPSC Civil Services would remain the same this year. Hence, the selection and allotment would be on the basis of the ranks. The UPSC Civil Services Main Examination 2018 time table has also been released. Candidates who qualify the UPSC Civil Services Prelims would then be required to appear for the main examinations scheduled for September. The ranks would be decided on the basis of the performance in the CSE Main examination 2018 as well as the interviews. Following that, the cadres would undergo the foundation course which carried 400 marks. The foundation course, as earlier, would be considered only for deciding the seniority of the probationer. As for the proposal, the report published in TOI confirms that the DoPT had sought replies and suggestions from the various ministries. A letter stating that the Prime Minister’s Office “has desired (them) to consider the suggestion and necessary action on it for its implementation from the current year itself ” was sent out to all the respective ministries. However, the proposal stands opposed with Congress and Left parties criticizing the government for the same. As per the opposition, the changes are mere eyewash and are a means of upgrading their preferred candidates to choice civil services.